During the troubled years of the war against Japan, most of the Chinese industrial base concentrated in Shanghai was lost. In 1945, only 10% of the pre-war spindles were operative and, even though the Chinese industry recovered between 1945 and 1947, the economic crisis and political instability of China forced Shanghai capitalists to diverse and relocate their businesses. In the summer of 1946, some spinners of Shanghai began to investigate the possibility of establishing cotton mills in Hong Kong, a city with a stable currency, a solid banking system and trading facilities. Despite being a British colony, Hong Kong had not built a relevant textile industry before. But in the following years, cotton spinning and weaving mills were founded by Shanghai capitalists and Hong Kong became a centre for the textile and garment industry that would eventually export to the five continents. 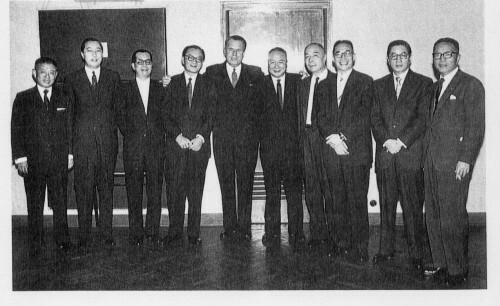 Source: J. M. Braga (1957): Hong Kong Business Symposium. South China Morning Post, Hong Kong. The first company that built a spinning mill in Hong Kong was South China Textile Limited (大南纺织有限公司), a firm founded by Shanghai capitalist C. C. Lee (Li Zhenzhi). Having acquired previous experience as a manager in Shanghai’s Datong Spinning and Weaving Company he settled down in Hong Kong around 1945. He started as a trading broker between both cities until he finally decided to open a factory in Kowloon. After trying unsuccessfully to train women workers from Guangdong, he brought 60 skilled workers from Shanghai. The shortage of skilled workers and labour legislation in Hong Kong were two of the main concerns of the first Shanghai spinners. Finally, in the first months of 1948, the firm started to produce cotton yarn with 5,000 spindles and a capacity to produce 12 bales of yarn per day. 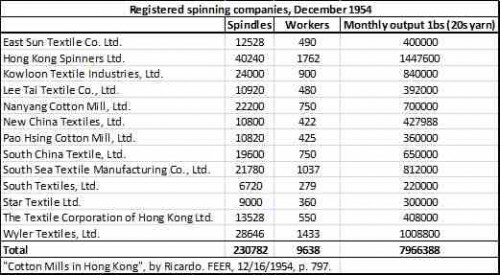 The second company to spin cotton was Hong Kong Spinners Limited (香港纺织有限公司), a firm associated with Shanghai’s China Cotton Mills. China Cotton Mills was a joint Sino-British company established in 1939 by C. Y. Wong, (Wang Qiyu, a merchant from Ningbo who became an industrialist in Shanghai) and William Charles Gomersall, a man with British and Chinese origins that owned China Engineers, a firm that imported textile machinery from Britain. In 1947, China Cotton Mills managed two spinning factories in Shanghai and had bought more machinery in Europe, but the difficulty in obtaining import licences drove them to put the machinery to work in Hong Kong instead of Shanghai. C. Y. Wong, a pioneer in the Chinese dyeing sector, was over sixty years old and left the new business to his son, T. Y. Wong (Wang Tongyuan), who would become one of the most important spinners in the city in the next decade. Hong Kong Spinners started operations in 1948 in a factory that was located in Kowloon’s Lok Shan Road near To Kwa Wan Road Initially, the plant (called Peninsula Spinners Limited) had a capacity of 8,000 spindles, but shortly after, a new bigger and modern mill was built in Cheung Sha Wan, with 35,000 spindles. William Charles Gomersall had an important role as a middleman between the new industrial concerns, initiated by the Shanghai spinners, and the Hong Kong banking system, dominated by British businessmen. Gomersall had access to credit loans from the most important banks of the city, and gave financing facilities to the Shanghai spinners with a commission. He was also responsible for buying machinery in England in advance of the profits of the companies and facilitating the purchases of raw cotton in the foreign markers. Some of the machinery that was used to build the mills in Hong Kong had been ordered during the war period and were supposed to be used in Shanghai. However, as the situation in mainland China worsened at the end of the decade, it was finally placed in Hong Kong. However, some difficulties needed to be solved such as the climate, being hot and humid, and the lack of skilled workers. The first problem was solved by the introduction of air-conditioning machines; the latter by bringing experienced workers from Shanghai and recruiting them as trainers. For all these reasons, it took normally one year or more from the moment the companies were registered until they could start to produce. From left: Mr. Vincent Woo (Central Textiles), Mr. H. C. Yung (荣鸿庆,Nanyang), Mr. C. S. Loh (陆菊森, Wyler), Mr. T. Y. Wong (王统元, Hong Kong Spinners), Sir Michael Turner, Mr. C. C. Lee (李震之, South China), Mr. Mou Lee (李楙, Kowloon), Mr. Y. C. Wang (王云程, Nanyang), Mr. Z. D. Woo (何瑞棠, Hong Kong Spinners) and Mr. T. Y. Tung (童振远, South China). Source: 40 Years of the Hong Kong Spinning Industry, p. 58.The next companies to settle in Hong Kong came from one of the most important Chinese industrial groups. During the 1930s, T. K. Yung (Rong Zongjing), the boss of Shenxin Group, owned 20% of the total spindles of the country and was one of the richest men in China. He was one of the most important tycoons of the golden age of Shanghai’s bourgeoisie but, when the war broke out, he moved to Hong Kong where he died in 1938. Then, his extended family started a fight for control of the business. One part of the industry was moved to Nationalist Chongqing while other assets remained in occupied Shanghai. Finally, at the end of the 1940s the family was dispersed between mainland China, Hong Kong and Taiwan. 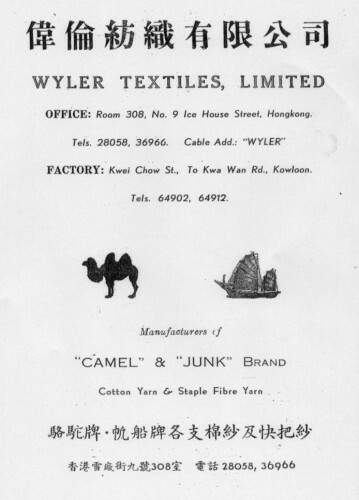 In Hong Kong, Wu Kunsheng (with the support of one of the sons of Zongjing, Hongyuan) and other shareholders such as C. S. Loh (Liu Jusen) founded Wyler Textile Limited (伟伦纺织有限公司) and built a spinning factory in To Kwa Wan. At the same time, Y. C. Wang (Wang Yuncheng), grandson of Rong Zongjing registered with his relative H. C. Yung (Rong Hongqing) a company called Nanyang Cotton Mills Limited (南洋纱厂有限公司) and opened the first vertically integrated mill capable of spinning, weaving and dyeing in Kowloon (Ma Tau Kok Road in Hunghom, on the seafront). The company was in search of more capital and found an enduring partner in Lord Lawrence Kadoorie, who became Chairman of the board of directors from 1948 until his death, in 1993. Finally, Liu Guowei who managed the Shenxin business in Chongqing during the war and his relative Mou Lee (Li Jiyao) founded Kowloon Textile Industries (九龙纺织有限公司) in 1948 where they opened a factory in Shum Tseng, near Castle Peak Road. The company started to operate in the spring of 1949. These three companies that appeared more or less at the same time came from the same family origin (the Rongs) and shared the same business legacy (Shenxin). However, they represented different factions and their relationship was rather complex. Three more companies entered the race for cotton spinning before 1950. South Sea Textile Manufacturing Co. Ltd. (南洋纺织有限公司) was founded in Tsuen Wan by Tang Xinghai (Tang Ping Yuan) in March 1948 starting operations in January 1949. Like C. Y Wong, Tang Xinghai was a pioneer in the Chinese dyeing sector and, like the Rongs, came from Wuxi, in Jiangsu province. The Tangs were a wealthy family that sent their male members to be educated at the best universities in the US, such as Boston’s MIT. However, in 1945, some members of the family were accused by the Guomindang of collaborating so it is very likely that the Tangs left China for this reason. Another company, South Textiles Limited (香港东南纺织有限公司) was founded in 1948 but started to operate in 1949 in Castle Peak Road. The firm was run by the sons of a famous textile trader and industrialist named Liu Guojun, who decided to stay in Communist China. During the war, the Liu family had already moved one factory from their native Changzhou (also in the Jiangsu region) to the safety of Shanghai’s International Concessions. The sons of Liu Guojun, Liu Hankun and Jerry H. T. Liu (Liu Handong) moved to Hong Kong afterwards continuing with the textile business. Meanwhile, the daughter of Liu Guojun (Liu Biru) married Cha Jimin, a dyer who pioneered in establishing one of the first and most important finishing mills in Hong Kong: China Dyeing Works (中国染厂有限公司). Finally, a small company, Lee Tai Textile Company Limited (联泰纱厂有限公司) also started to operate in August 1948 with 5,000 spindles in Shatin. The company was founded by T. C. Ying (Ying Dingcheng) a Shanghai spinner from the region of Ningbo, like C. Y. Wong. At the end of 1948, six of these mills were operating and the number of spindles totalled 120,000, with a production capacity of 7,200 bales of yarn per month, far exceeding the capacity of the weaving and knitting sector of the city. The rest of the factories would open the following year. The weaving and knitting industries had been the most important industrial sector (besides shipping) of the economy of Hong Kong before the war, with 550 companies employing more than 40,000 workers in 1937. But the war dealt a severe blow to the sector mainly composed of small and middle companies and most of them disappeared. 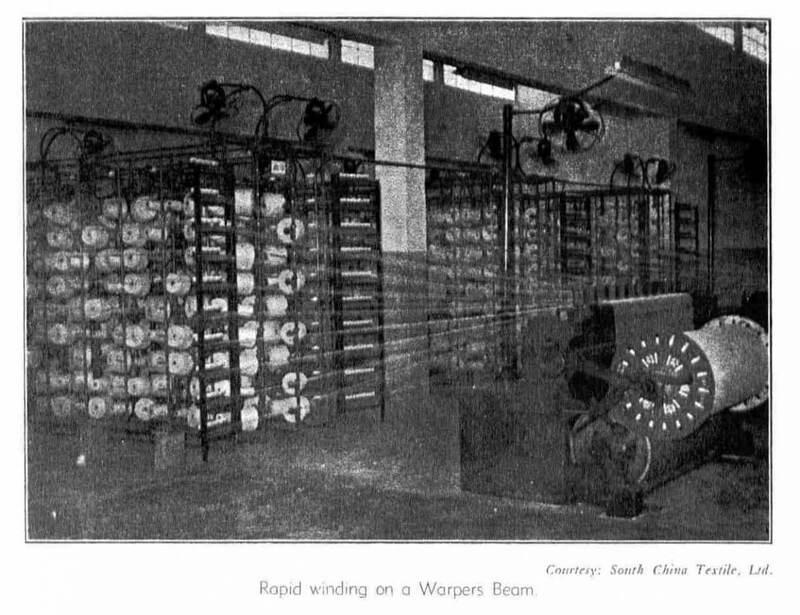 However, the development of the spinning business helped the knitting and weaving sector to recover and forge ahead at pre-war production levels making Hong Kong an important exporter of yarn and finished cloth as well. In the beginning, the spinning mills turned to the Chinese market. But the difficulties in getting import licences under the Nationalist regime and the restrictions of the Communist Party after 1949 to import cloth made them change their minds. Then, the Korean war broke out and trade between China and Hong Kong came to a standstill. New markets were opened up for the Hong Kong spinners. The Second World War had a profound impact on the industrial powers that exported textile products to South-East Asian markets. Great Britain and Japan were not in a position to export textiles at that time (although Japan and India would become strong competitors of Hong Kong shortly afterwards). Thus, Indonesia was one of the first and most lucrative markets for the Hong Kong spinners, followed by Malaysia, South Korea, Pakistan, Burma, Taiwan, and the Philippines . During the 1950s, Hong Kong’s textile industry expanded and reached other continents such as Africa (South Africa), Europe (England and West Germany), Australia and America (the United States). Although, Hong Kong had no raw cotton it was a commercial entrepôt centre that could import fibre from the South Asian cotton fields and from the USA. However, imports of raw cotton from the US were restricted by the trade blockade with China and the emergent Hong Kong industry had to find other supplies, not only in Asia (Pakistan, Burma), but also in Africa (Kenya, Sudan), Middle East (Egypt, Syria, Iraq, Turkey) and America (Brazil, Argentine, Peru). Consequently, Hong Kong became a strategic textile centre that participated in a truly global trade. At the same time, Hong Kong experienced a process of industrialization and the government provided facilities for the new industries. It changed its labor regulations so women would be permitted to work before 6am in the morning and after 8pm at night. Cotton spinning mills were provided with dormitories, medical facilities and meal and cloth subsidies for a working shift that, at the beginning, lasted 12 hours a day. However, after the first years, the government changed to three shifts of eight hours a day. The first problem that the spinners had found between 1947-58, the lack of industrial workers, was partly solved by the massive immigration of refugees who entered the colony after 1949. 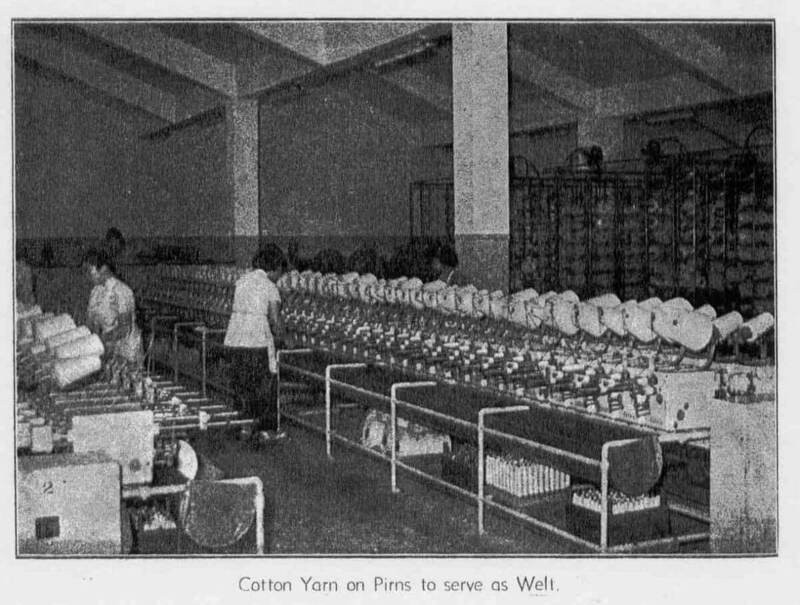 The continuous flow of migrants enabled cotton factories to keep salaries low while the price of yarn was high due to the postwar scarcity, securing a good margin. The mills soon doubled their size. Wyler started with a factory of 140,000 square feet which expanded to a total of 225,000 square feet very shortly afterwards. 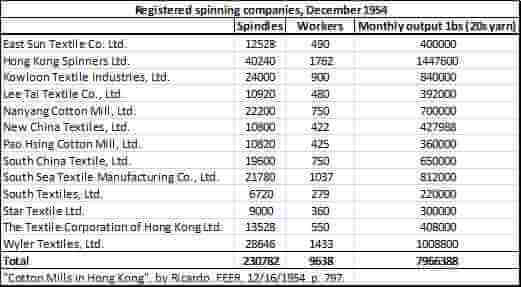 Hong Kong Spinners began with 8,000 spindles but in one year it would increase its capacity to 37,000 spindles, becoming the biggest industrial company at the end of the decade. Since all the spinning industries were concentrated in Kowloon and Tsuen Wan these places became industrialized and urbanized. 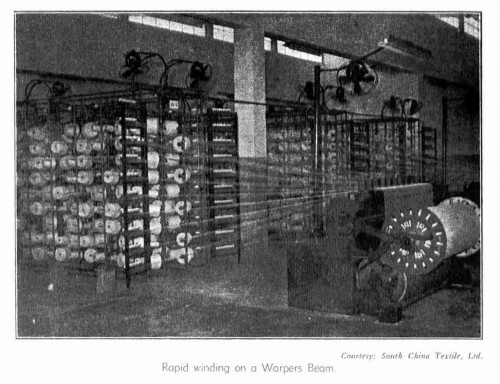 In 1950, eleven cotton spinning mills were operating in Hong Kong with a total of 165,000 spindles producing 10,100 bales of yarn per month. The success of the cotton spinning mills was related to the modernity of the factories (they all used new machinery), the price/quality ratio of the goods and the potential of trading with overseas markets. However, some markets, such as Malaysia and Africa, did not have the ability to finish textiles, and, thus were not interested in buying cotton yarn. This impelled the spinning companies to become vertically integrated installing annex mills for weaving, dyeing and knitting. The development of the spinning industry during the 1950s paved the way for the boom of apparel and knitting of the next decades. 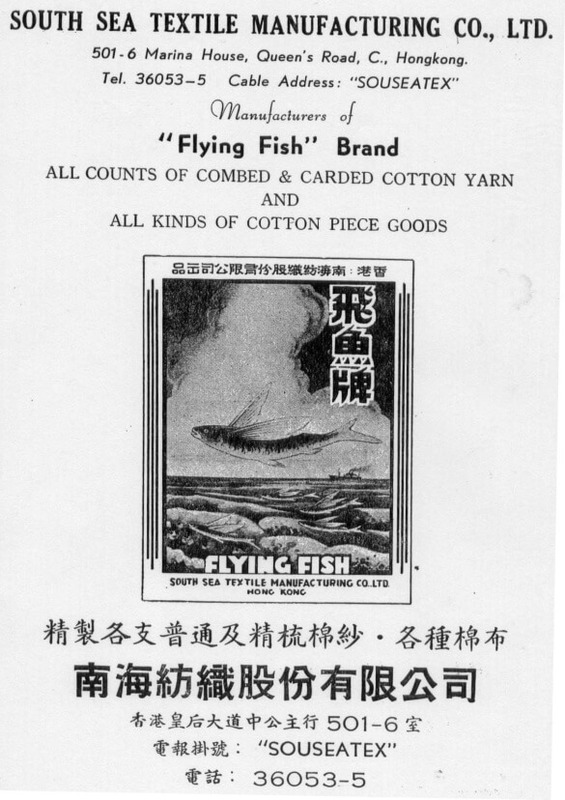 As they grew, textile companies invested in marketing and publicity, launching famous commercial brands like Golden Peak (Nanyang Cotton Mill), Flying Fish (South Sea), Camel (Wyler Textiles) and Red Rose (Hong Kong Spinners Limited). Source: Hong Kong Textile Annual, 1956. In 1955, The Shanghai spinners felt the necessity to create an association to represent the interests of the 13 spinning companies that already existed. Thus the Hong Kong Spinners Association was inaugurated and its members chose C. Y. Wong (Wang Qiyu), the founder of Hong Kong Spinners, as its first Chairman and Tang Xinghai, from South Sea Textile Manufacturing, as Vice-Chairman. By this time the textile industry had become the largest industrial sector of Hong Kong’s economy. This paper was made possible through a post-doctoral research grant from the Chiang Ching-kuo Foundation, European Programme. I wish to express my greatest appreciation for the generosity of this organization. Far Eastern Economic Review (FEER), 1947-1956. Hong Kong Textile Annual. 1956. Hong Kong Merchants Association. Kubo, Toru (2009): “Chapter 1: Development of Cotton Industry in Postwar East Asia: Case Studies in Hong Kong and Taiwan”. In久保亨 (2009): 20 世紀中国経済史の探究. 信州大学人文学部, pp. 19-36. The Hong Kong Spinners Association (1973): 25 years of the Hong Kong Spinning Industry. Hong Kong. 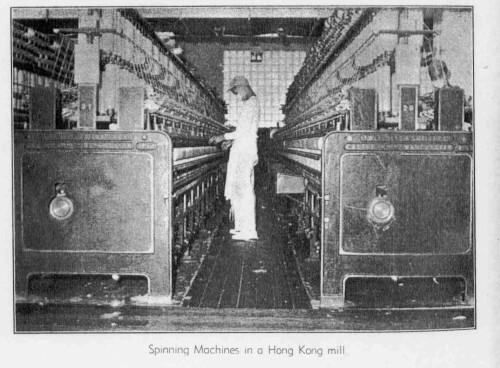 The Hong Kong Spinners Association (1975): A Glance at the Hong Kong Cotton Spinning Industry. Hong Kong. The Hong Kong Spinners Association (1988): 40 years of the Hong Kong Spinning Industry. Hong Kong. Wong, Siu-lun (1988): Emigrant entrepreneurs. Shanghai Industrialists in Hong Kong. Hong Kong: Oxford University Press. I am doing a program on beading and I am trying to find out more about all the beautiful beaded handbags and sweaters that came out of Hong Kong in the 1950’s. Did the same families that you mentioned in this article get into the beading market as well? The quality of the work is so amazing that I am wondering where their labour force came from, Chinese refugees, perhaps? I’m afraid I don’t know anything about beading in Hong Kong during the 1950’s. I will contact Carles, author of the article, to see if he can provide any information. If you discover more about this area it would be would very good to hear from you. Sorry for my late reply. My guessing is that beading handbags and sweaters were produced in smaller production units, not spinning and weaving mills, but weaving and knitting workshops and factories that developed also in the 1950s Hong Kong. The families that appear in the article also owned smaller firms that were specialized in this kind of production, such as Eternal Garments, Leighton Textiles or Hong Kong Spinners. I think you should look at these companies to find the beautiful beadings you are looking for, although the information on these firms is naturally scarcer. Knitting production was already in Hong Kong before the war and it could be that these skills were already developed in Hong Kong before the arrival of the spinners from Shanghai. I’m not sure. However, the Shanghainese spinners brought with them skilled workers (especially in operating machines) to establish their mills in Hong Kong. 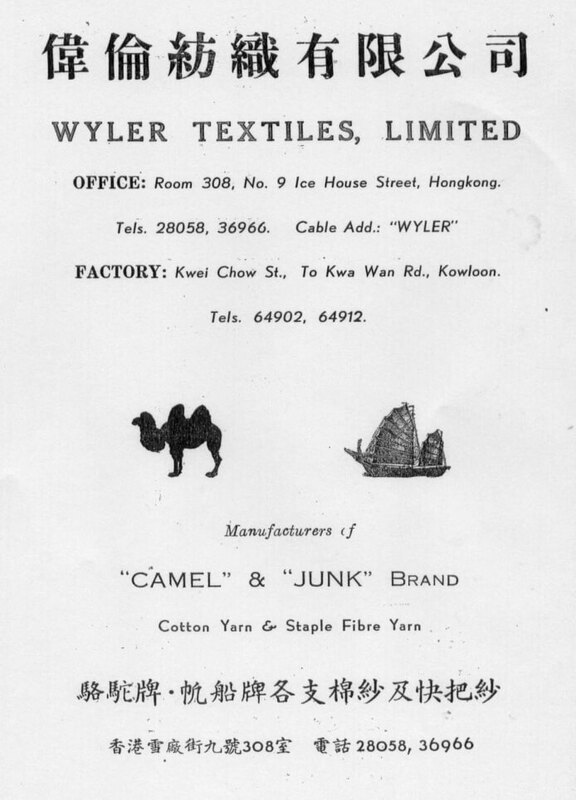 Also tailors and other textile professionals moved to Hong Kong at the end of the 1940s from Shanghai. We could know more about the origins of these products by tracking the brands, if any. Just came across this interesting page. My grandfather, who also immigrated to HK from Shanghai, was involved in Lea Tai Textile (here noted as “Lee Tai”), alongside Kenneth Fang of Fang Brothers Knitting. Neither are named here, but do you know anything further about the development of this company? It still exists today, but I know little about it. Would be interested to learn more. Thanks. Many thanks for your comment. I am afraid I do not know anything more about the Lea Tai (Lee Tai) Textile company. Or Kenneth Fang and Fang Brothers Knitting. I will contact Carles, author of the Shanghai Spinners article, and see if he can help. If you find further information about either company please let me know. It started in 1948 with 5,040 spindles and in 1973 had 31,248 spindles and 544 looms. After some difficulties in 1978, the factory was moved from Sha Tin to Fo Tan and had to curtail production. The company was run by Fang Shao-chow (that may be Kenneth Fang) and produced the brands pine&bamboo and pine&crane. Thank you (very belatedly!). If anyone knows any more about Lea Tai (Lee Tai) or a related company Calico, please post here. Thanks. Well done. I enjoyed learning about the cotton farms and Textile business in this article. Thank you for your informative article. My grandfather Robert Fan Wenzhao (1893-1979) was the architect who designed the HK Spinners factory at Cheung Sha Wan, including workers dormitories, a dining hall, a recreation area, basketball and volleyball courts and a playing field — a complex about three or four blocks long. If you have any more information on him in particular, I’d be grateful to know it. I’m also looking for any references to a Prevocational or Provisional School of the Hong Kong Textile Industry. It was designed by Robert Fan’s daughter Gloria Fan, also a US-trained architect, who returned to HK briefly in 1955. She worked with her father either that year, and / or in the 1960s or early 70s. I can find no record of it, but perhaps it was not built? (My father, Robert Fan Jr., also an architect, worked with his father from 1958-1963 before moving to the US; my Uncle Ben, took over his father’s firm in about 1973). I am writing thesis on one of your grandfathers’ works Majestic Theatre(1941) and I am trying to find out more about the details during the construction. I am keen to find out what happen at that time, including difficulties and challenges he came across and how he handled them. Unfortunately, I have no access to early documents of it. If you have any information I’d be grateful to know. You will find some photos there of the factory, but no reference to the architect, as far as I know (maybe Eleanor Wong can tell us something more). Unfortunately, in the documents I know, I’ve not found information about architects. However, you could well try at the Hong Kong Public Records Office (there should be the official maps of the factories signed by the architects, I suppose). Y. C. Wang is not Rong Zongjing’s grandson, he is the son-in-law. He married Rong Zongjing’s third daughter, and she passed away in the 1930s. The Chinese name of South Sea Textile Manufacturing Co. Ltd. should be (南海紗厂有限公司) instead of (南洋纺织有限公司) . The latter is the Chinese name of Nanyang Cotton Mills Limited .